The ESSENTIALS pH Meter is truly the most rugged glass type pH tester around. It is water and dro.. The submersible HAILEA Glass Heater is fully thermostatically controlled and is ideal for the heatin..
VitaLink ESSENTIALS pH Down (81% Phosphoric Acid) is a quality adjuster necessary to control the pH ..
VitaLink ESSENTIALS pH Down 250ml (81% Phosphoric Acid) is a quality adjuster necessary to control t..
VitaLink pH Up 50% 1L is a quality adjuster necessary to control the pH of nutrient solutions. 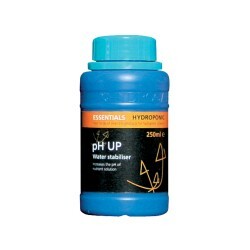 Conce..
VitaLink pH Up 50% 250ml is a quality adjuster necessary to control the pH of nutrient solutions. Co..